If you want to soak and relax in a hot bath, there is nothing that can help you quite like a shower caddy. In a nutshell, these accessories keep your toiletries organized and can be cleaned up easily. However, the best feature of shower caddies is their functionality. You can literally put all of your bathroom products including the shampoo, conditioner, razor, hair mask, soap and everything else on them – and always have easy access to your products. Shower caddies usually hang from your shower head, giving you useful bathroom storage. However, they can be used out of the shower too – all you need is a few hooks to your wall and hanging a caddy will be possible anywhere. Just make sure to install your caddy at a height that you (and your family) can reach with ease and mark it with a pencil dot. When it comes to the actual products and designs, there are literally a lot of them. Today, we are listing the best shower caddies on the market judging by their popularity, functionality and online reviews. First on our list of best shower caddies is the model by Zenna Home. 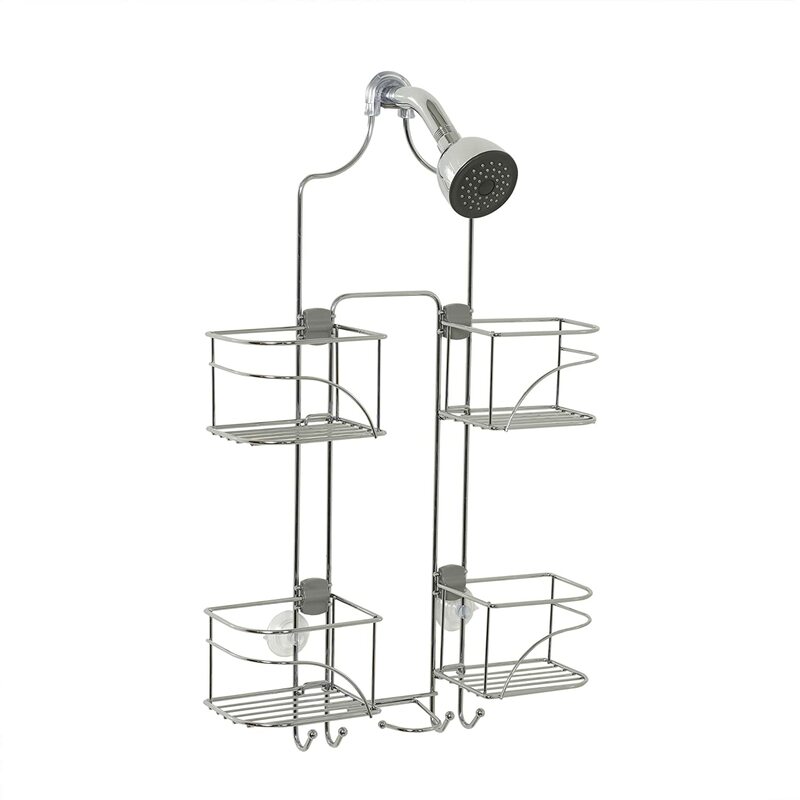 This expandable over-the-showerhead caddy is rust resistant, combining elegance with functionality. There are for large basket shelves which are positioned in a 2×2 grid, allowing the caddy to be used with a handheld shower hose or large bottles. The design comes in two colors – chrome and bronze. What makes this product great is the exclusive Swivel Lock non-slip collar as well as the suction cups which keep the caddy stable and prevent swaying. 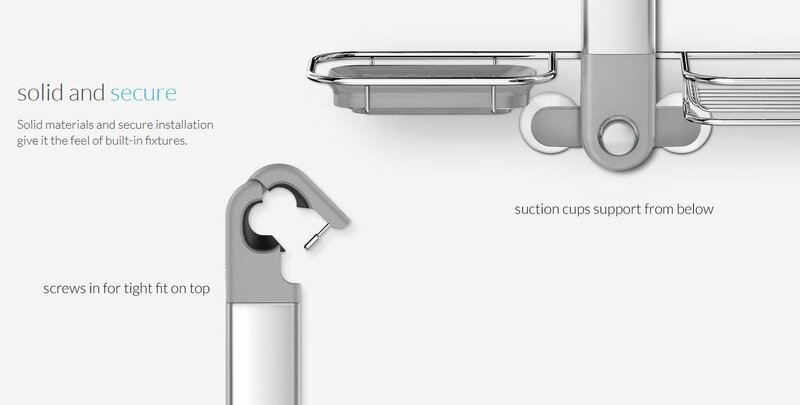 There is one large center hook that keeps the shower hose tidy while not in use – as well as four smaller hooks at the bottom which enable you to hang razors, washcloths, poufs and other products. The InterDesign York Lyra bathroom shower caddy is among the most affordable products that is a true bestseller on many online sites. For many, this is a classic bathroom accessory that doesn’t take up much space and gives you amazing storage options. 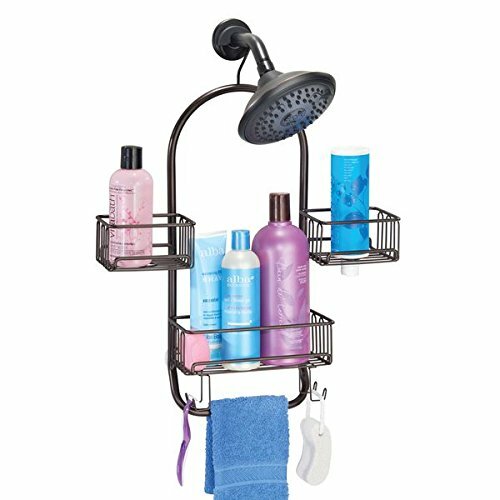 You can literally hang anything on this shower caddy, from your shampoo to your conditioner and soap. This adjustable shower caddy is stylish and functional – designed to organize your shower space and make most of your shower essentials while keeping them within easy reach. Since the neck extends to make extra room, the design is also perfect for taller bottles and large items such as facial cleansing brushes, razors and electric toothbrushes. When it comes to the installation, it is solid and secured all thanks to the rubberized shower head clamp that supports the caddy from above – and the twin pivoting suction cups that support it from below. Keep your shower essentials close at hand with one of the best shower caddies from mDesign. The product comes in a variety of colors which makes it perfect for any bathroom. You can choose from satin, bronze, silver, matte black and matte white. The design is smart with built-in hooks for razors, loofahs, pumice stones, poufs and other items, accompanied by two strong suction cups and a no-slip grip at the top which keep the caddy in place. When it comes to installation, it is quite easy – all you need to do is hang over the shower head without any assembly or drilling required. 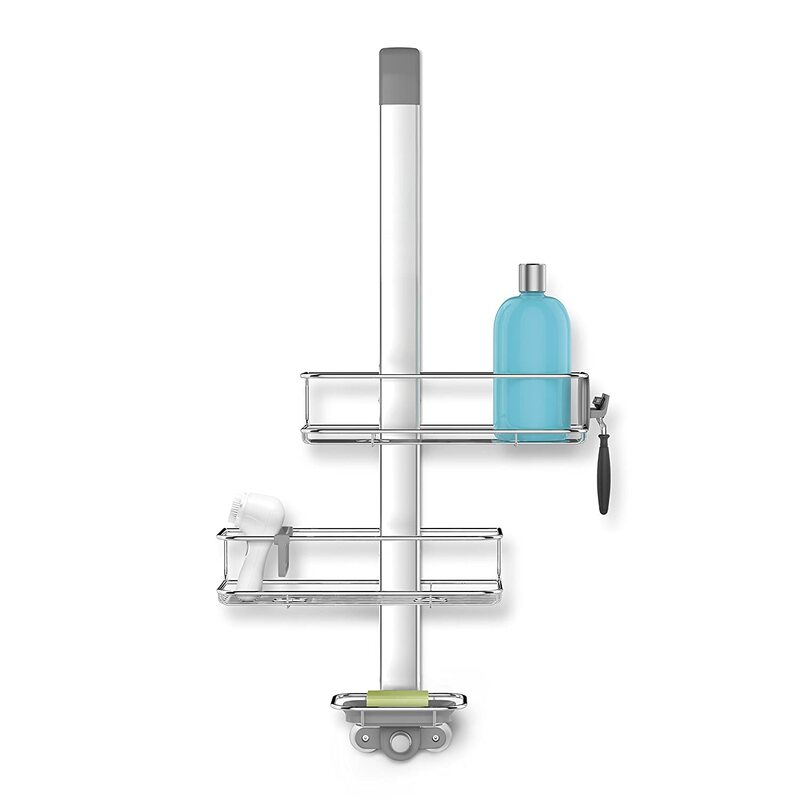 This shower caddy is great because it fits modern bulky shower tools – and yet makes room for taller bottles with a simple turn of the quick-adjust dial. It is easy to hook over shower door for a secure grip, and the adjustable hanger fits over any shower door, automatically tightening for a secure grip. The durable stainless steel, quick-dry features and specialty cut holes in shelves allow for effortless dispensing. 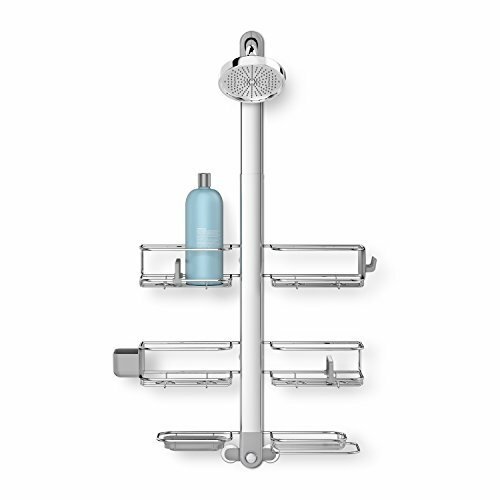 All in all, the simplehuman bathroom hanger is one of the best shower caddies on the market. In the end, the main function of a shower caddy is to store all your belongings and be practical, providing easy reach. What’s your duty is to find the best spot for the hooks by holding it against the wall. If a few people are using the shower, everyone can have their own caddy at a height that best works for them. We hope that our list of best shower caddies helped you choose a suitable product for your needs. Good luck!